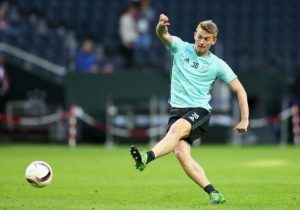 21 Y/O Celtic Loanee Returns To Chelsea: Should Rodgers Look To Sign Him Permanently Now? Chelsea have recalled their midfield starlet Charly Musonda Jr. from his loan spell with Celtic. According to recent reports, the Belgian youngster has returned to West London after his loan spell at Celtic Park. It is believed that Antonio Conte’s side has decided to cut the Belgian’s stay at Glasgow short due to the lack of first-team opportunities under Brendan Rodgers over the last few months. The West London outfit initially decided to let Musonda go out on an 18-month loan deal to Celtic back in January with the hope that he would get to experience regular first-team football under Rodgers. However, the 21-year-old has just managed to start in just two league matches for the Scottish Champions which has seen his loan spell cut short to just six months. Recent reports suggest that Chelsea will now look to loan him out to another club for the next campaign. “In Charly’s contract there was a review at the end of the season, whether they wanted to take him back or however it was. “The idea for Charly was to come and play as many games as he possibly could, and let’s review it at the end of the season. Between us both, we are thinking that he may not get the games that they would like him to get for next season. The Belgian wonderkid signed for the Chelsea Academy in the summer of 2012, winning two FA Youth Cups while also securing the Under-21 Premier League and a UEFA Youth League title during his youth career. However, he is yet to break into their first-team and needs some regular game time in order to develop and take his game to the next level. For now, it doesn’t look like the Blues can offer him a regular run-out in their starting XI next term. Hence, another loan move for the Belgian midfielder seems to be the most logical option. Although, the Bhoys of Glasgow should do all they can to sign him permanently this summer. He is exactly the type of player who can flourish under Rodgers but only if the Scotsman is willing to offer him regular starts. Read More: 20 Y/O Celtic Lynchpin Red Hot On La Liga Giants’ Radar: Why Rodgers Should Never Let Him Leave! Musonda is highly versatile and can operate on either wing or in the number 10 position which makes him an ideal fit for the Hoops. It remains to be seen what lies ahead in the future of Musonda and whether he ends up plying his trade at Celtic Park next season. Chelsea Linked With 40 Y/O Italian Defensive Legend: A Story To Fill The Pages? Manchester United Interested In Barcelona Defensive Star: Right Man To Replace De Gea? Celtic Makes £1m Bid For 22 Y/O Defensive Ace: Rodgers’ Big Bet In Pursuit Of Glory ? Celtic Interested In 28 Y/O Stoke City Midfield Ace: A Reunion On The Books For Rodgers? Will This Norwich City Defender Be A Proper Replacement For Simunovic At Celtic?